Our family friend, Major Shona George, during a walk around the city, was fascinated by a poster he found next to a drinking water fountain. He immediately clicked the above photo. Tap water is regulated by Health Canada and the provinces and territories. The Guidelines for Canadian Drinking Water Quality, spell out the maximum levels of potentially harmful substances that are allowed in drinking water. Municipalities test their water sources constantly to make sure that they are within these limits. Unlike bottled water, the cities test their water quality on a daily basis. Toronto tests water samples every four to six hours and checks for more than 300 potential chemical contaminants. The results of this monitoring are generally easily accessible to the public, often on city websites or on request. In Canada, bottled water is not subject to the same guidelines because it is classified as a food and falls under the Food and Drugs Act. Aside from arsenic, lead and coliform bacteria, the act does not set limits on specific contaminants but says simply that food products cannot contain ‘poisonous or harmful substances’ and must be prepared in sanitary conditions. ​Bottled water producers insist they perform a comparable degree of testing on their water, as do municipalities, but the results do not have to be made public — although some companies post sample water quality analyses online. The Canadian Food Inspection Agency (CFIA) inspects and takes enforcement action “as required” if it becomes aware of a potential food safety hazard “via a complaint or other means.” There have been efforts to introduce stricter bottled water guidelines, but these have been stalled for years, largely leaving the industry to police itself. Some brands specify an expiration date, although this is not required, and there is disagreement on whether water — if kept sealed and stored in cool conditions that don’t promote the growth of bacteria — can ever “expire.” The industry has said bottled water has a shelf life of two years, but Health Canada suggests replacing water after one year while the US Food and Drug Administration considers it to have an indefinite shelf life. As more consumers sip bottled water, fewer of them ingest enough fluoride to prevent cavities. According to the American Dental Association, if bottled water is your main source of drinking water, you could be missing the decay-preventive benefits of fluoride. It is really hard to recycle plastic bottles. 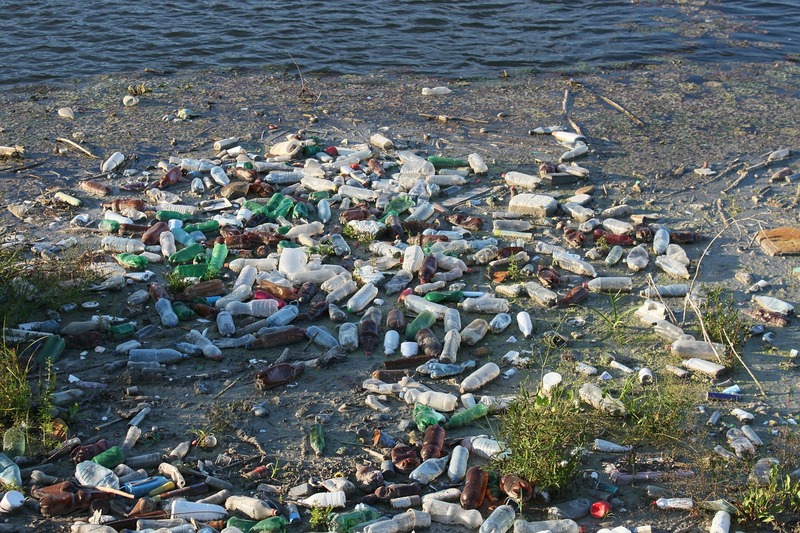 Most of these plastic bottles are not recycled and end up lying stagnant in landfills, on our streets, on the sidewalks, in parks, front yards and rivers. They end up discharging heavy toxins into the environment and also clogs up the sewage lines. They prove obstacles to the natural drainage of rainwater and causes stagnation. Stagnant water causes many germs to multiply and is an ideal breeding ground for mosquitoes. These inputs prompted me to study the municipal water supply system in our City of Mississauga, and investigate the claims of the Government of Ontario, which comes under the Peel Region. The water is then supplied through pipes, buried 10 feet below to prevent freezing in winter. Water in the pipelines is maintained at about 100 psi. There are three water towers in the city which are also connected to the pipeline. During low water usage hours, the tanks on the water towers get filled and they discharge into the pipeline when the pressure falls due to high usage during peak hours, thus maintaining the optimum pressure. There is thus no need for overhead tanks at the end users’ home as the city guarantees 24 hours water supply at optimum pressure. As the water in the pipelines is maintained under high pressure all throughout, there is hardly any chance of muddy water from the ground getting into the pipes. Entry of dirty water or sewage into the pipeline is possible only when there is intermittent water supply and there is a crack in the pipe. The water in the pipe leaks into the soil around when under pressure. When the water supply is shut down, the pressure in the pipeline drops below the pressure of water in the soil, forcing muddy water into the pipeline through the crack. When water supply is restored, this muddy water in the pipes reaches the consumer. Thus one often finds muddy water flowing down for a few minutes when water supply is restored. This is why the claims of the Ontario Government that the best drinking water is the municipal tap water, stand fully vindicated. The most dangerous element in bottled water is the added Salt to improve the taste. In 1995 I had initiated to launch bottled water by Caico in Kerala & the promoting slogan was Taster than regular water. Incidentally Navy was the biggest customer. This product was dropped in 1999 as the profitability was less. I remember how shocked I was to see that poster in St Catherine’s. 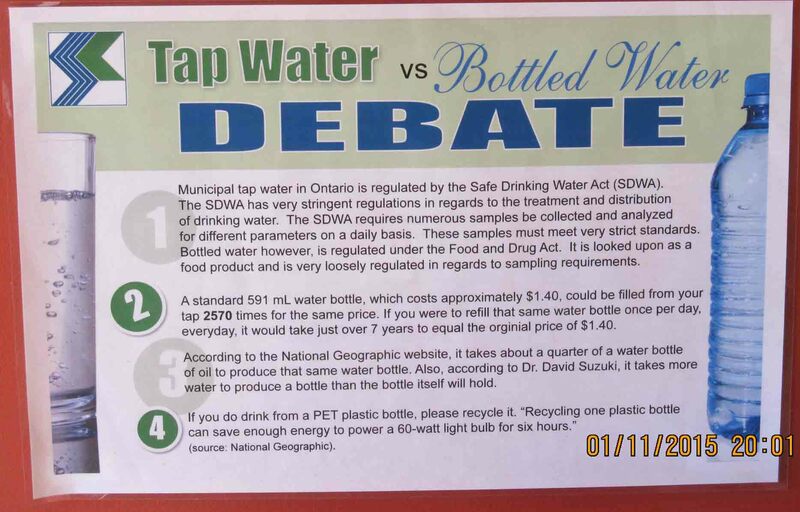 I knew that tap water was safe to drink in Canada but the city administration espousing tap water over commercially available bottled water was an eye opener. Kudos.